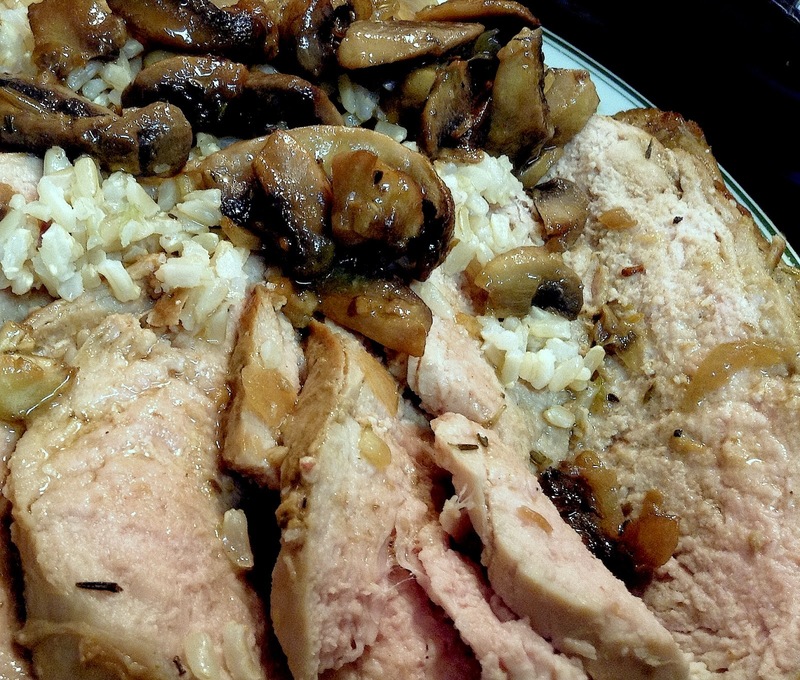 Believe it or not, there was a time when a pork tenderloin was only a few dollars. Boy, do I miss those days. Today, one will pay upwards of seven to eight dollars for one! When I saw some in the grocer close-dated and marked down to four bucks, I grabbed the two that were left. One I just seared and baked. But I wanted to be a bit more adventuresome with the second one. If you don't like star anise, use a bit of Chinese Five Spice instead--maybe 1/4 teaspoon. This had lots of flavor going on. I paired it with plain white rice. Don't let it marinate for more than two hours. I like my pork just a bit rosy in the center--about 145 F. degrees on an instant-read thermometer. Mix the first eight ingredients together in a small bowl. Taste. Re-season to taste remembering most of the marinade will cook off. Place tenderloin in a plastic bag and add marinade. Massage a bit. Place in refrigerator and marinade for at least one hour and no more than two. Heat an an oven-safe pan (about 7-8 inches) over medium heat until hot. Add a bit of butter and olive oil. Remove tenderloin from marinade. Shake a bit but do not dry it off. Add to pan. Is fine to curl it around the pan the sides of the pan. Sear on four sides until brown. You are not cooking it, just browning the outside. Add the dry white wine and butter to de-glaze the pan. Allow alcohol to cook off a minute or two. Add sliced mushrooms and shallots. 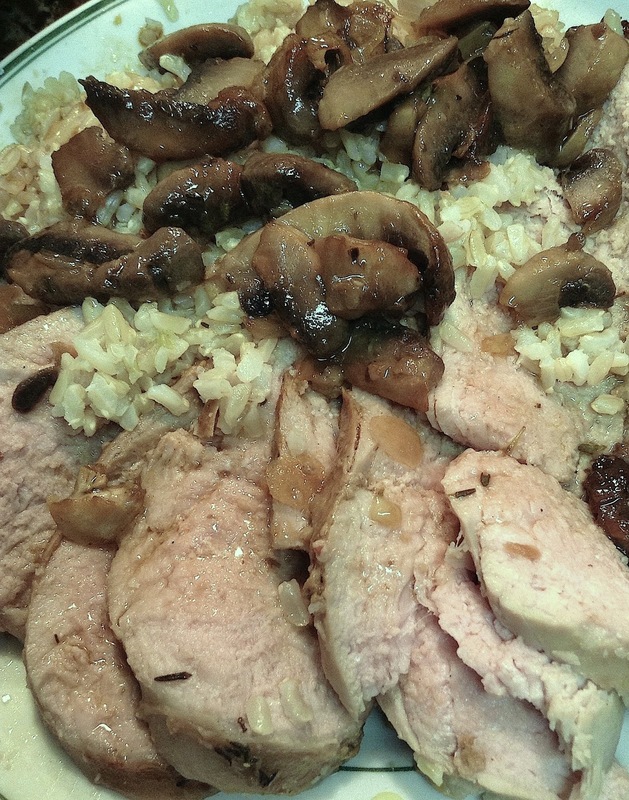 Continue turning the pork as mushrooms cook a bit. When mushrooms begin to give off their juices, add some of the flour/stock mixture. You probably won't need all of it and will want to add more half way through the cooking process. Transfer pan to oven. Bake for about twenty minutes, adding more stock mixture if necessary after about ten minutes or so. Roast until instant-read thermometer registers 145 F Degrees. Remove from oven. Tenderloin will continue to cook in hot pan. OR ... after removing from oven ... transfer tenderloin to serving plate/board. Tent with foil for about ten minutes before carving. Add a bit more butter/stock/wine to drippings in pan with mushrooms. Place on low heat on a burner. Stir. Combine. Taste. Carve tenderloin into 1/4-inch slices. Place around rice. Drizzle rice with pan drippings or a bit more soy sauce. Top with mushroom mixture. Lovingly, serves two. Piggishly, one. Frugally, three. Anorexically, four.